We are proud to introduce the new Alimak SC 45/30 passenger and material construction hoist for sale today. The new product was made with the quality Alimak Engineering that can lift heavy loads but is also safe and energy-efficient. The system features a stop-next-landing control that is possible because of the microprocessor installed in the product. It solves the problems in site logistics because it allows for medium range transport of all types of construction materials because of its increased capacity and mass climbing platform. A climbing platform that can handle big vertical carrying jobs makes it a reliable product. This is coupled with a low rental or purchase cost and easy dismantling further lowering costs incurred by our clients in the industry. 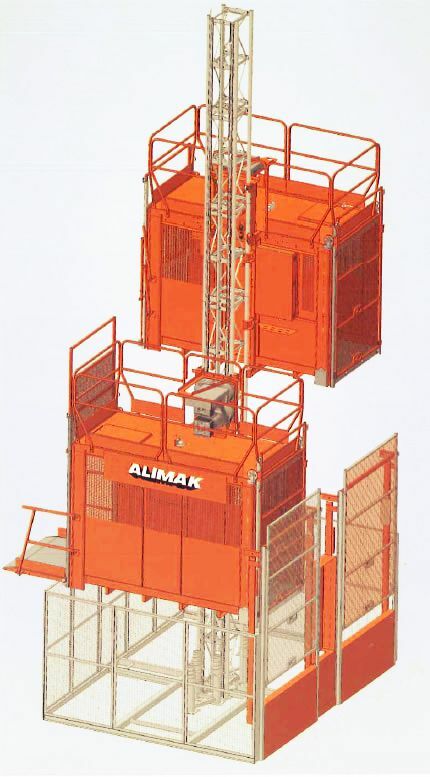 The Alimak SC 45/30 is built for regular operation with it’s smooth control of the platform as it goes up and down the construction site. It is designed with a door and ramp option for versatility in usage and will extend the life of the construction hoist. Also included in the design are safety features like an overload sensor, an interlocking door system, and the patented Alimak safety device. The gearbox technology use in the Alimak SC 45/30 will reduce energy use by 30 percent making at a highly efficient construction hoist. A modern rack-and-pinion technology of Alimak is used in the new product to withstand the big workloads and harsh environment in construction projects. Clients can choose from three different hoists which include vertical door, vertical door with materials ramp, and a bi-folding door. Smooth operation of the unit is possible with Alimak’s Variable Frequency Technology (FC) because it uses a low starting current that controls the operation from vertical operation to accurate landing each time. Less wear and tear is also possible because the control rack is located at the center for equal distribution of work through all parts. Clients will find the Alimak SC 45/30 easy to install and dismantle. The design has lifting eyes with two units located on the car roof and drive unit. This makes it easy to put together the parts and removing the connected parts would be quicker as well. Interested clients can purchase a passenger hoist us which includes the product and the after-sales service that we have. You can also contact us if you want to rent out any of the quality passenger hoists we have available.